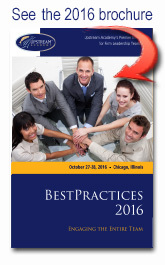 BestPractices 2019 will be held October 24-25, 2019 in Chicago. Watch for additional details soon! Tri-Merit serves leading CPA firms and their clients by providing Specialty Tax Services to identify and secure maximum credits, deductions, and incentives. Ernst & Morris is the nation’s oldest and largest firm dedicated to performing Cost Segregation and 179D Energy studies. E&M works with hundreds of CPA firms and has completed over 15,000 engineering based studies. Ernst & Morris offers superior service and technical assistance including complete audit support. Practice Engine™ combines a strong technical emphasis with close client relationships to secure and retain a substantial list of top firms as clients. We achieve this through our browser-based Practice Management system that is suitable for all sizes of firms who are looking for a strategic product that will meet their current and future needs. 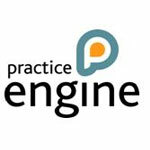 Practice Engine™ provides this using the latest database and web technology. Anderson ZurMuehlen Technology Services brings 60 years of accounting firm experience into our services and our approach. We understand accounting firms - your operations and your clients. Our passion is to improve the lives of those we work with, and we are eager to share our expertise with you. With a suite of technology offerings, including IT Security, Desktop-as-a-Service and Business Intelligence, we form true partnerships with our clients to help them succeed. 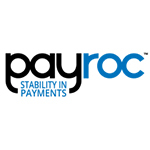 Payroc is one of the largest Payment Processing companies in the Nation. They get CPA firms paid from their clients more quickly and economically, while simultaneously giving firms' clients options for paying their bill. They will help you reduce your DSO, save you money, and increase your clients' satisfaction. The next five years will likely bring the biggest changes we've ever seen in our profession. The firms who can create a work environment that is highly sought after by both the youngest generation entering the work force and the wave of new young leaders assuming seats in organizations across North America will be able to capitalize on the challenges and the opportunities. 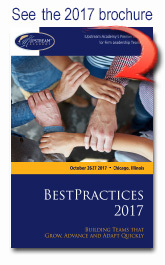 Join us for BestPractices 2018 and industry experts will provide step-by-step guidance to creating a firm no one wants to leave. Our firms devote significant resources to recruiting and hiring the best. Unfortunately, turnover rates in CPA firms are up and likely to continue to rise. Maintaining and growing your staff is not just about better benefits and shorter hours – or even about providing a “work-life balance.” It is about work-life integration. Join Tom in this compelling presentation to learn how to create a culture unlike your competitors, one in which your employees can build their careers, achieve their life goals and find their true purpose. We’ve talked about the benefits of building a better model for retention. Now let’s talk about how to get there. Tom will discuss how to create social capital in your firm that allows your people to make a difference in their world – bringing clients service to the next level, tying your people to your firm and building excitement and engagement on all levels. He’ll explore what social capital is, how it works, and steps you can take to proactively build the trust and relationships you need to make it a reality in your firm. It’s hard to get to the end you desire, if you don’t have a plan. Yet many firms approach culture as inherent, rather than the natural extension of the people, processes and policies of the firm. Have you created a blueprint for the firm you want to be? Are you proactively developing the processes and policies that will lead you to the culture and attributes you desire? Join Sam as he discusses the action plans of high-performing firms, how to determine what’s most important for your firm, and how to take proactive steps toward the firm culture you desire. The next generation is mobile and constantly looking for new opportunities (both within your firm and elsewhere). 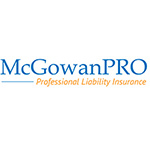 Yet many young professionals lured away from public practice by industry or government, regret losing those things they took for granted as a professional service provider. So what are you doing to re-recruit your top talent and make sure they don’t walk out the door before you realize they’ve thought of leaving? Join Tim as he discusses why and how to generate a list of benefits of a long-term career at your firm – and what to do with the list once it’s ready. Top performers have an expanding array of choices, and departures of three to seven year professionals are on the rise. What are you doing to ensure that you have policies in place to recruit, retain and effectively develop top talent? If you want to stay competitive, you can’t continue with the same employment practices that worked in the past. So, how do you appeal to the new generation of recruits? And how do you encourage your best people to stay (and recruit their friends)? Join Jonyce as she stretches your thinking in the areas of team recruitment, retention and development. Client Needs or Staff Needs: Do You Really Have to Choose? The old adage, the customer’s always right, probably takes client service a bit too far, but there’s a kernel of truth in it. A firm has no future, if it can’t generate revenue (and loyal clients). But good luck “wowing” clients without exceptional employees. Great client service becomes impossible with employees who are disillusioned, disengaged or burnt out. And it’s difficult to keep employees motivated, engaged and providing innovative solutions, if they don’t feel like a priority. So how can you balance sometimes conflicting staff and client needs? Join Steve for this insightful presentation. Most of us have heard enough (or maybe too much) about Millennials’ differing priorities, working styles and ambitions. So what about the post-Millennials? Hopefully firm leaders have learned that lamenting generational differences won’t force top talent to accept another generation’s priorities. Now that Generation Z is on its way – graduating college and considering your firm as a possible employer – what can you expect? Supposedly Millennials killed fabric softener, napkins and firm loyalty, so what’s next on the chopping block? Or on the flip side, what new opportunities might this generation bring. Join Dena for a discussion of the Generation to come. Many leaders find great satisfaction in creating a strong personal practice. This quest for (and focus on) personal production results has long been the norm for our profession. Unfortunately this mindset produces short-term benefits, while creating long-term challenges (underdeveloped staff, hoarding, difficult client transitions, etc.). Healthy firms are built when great partners help grow other great partners. 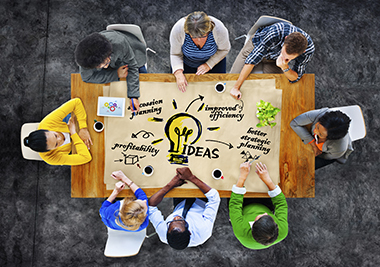 So how can you encourage partners to focus on taking a servant leadership role? Join John as he discusses how to adjust priorities and create a one-firm mentality throughout your partner group. Always one of the most popular features of Upstream conferences, our afternoon discussion forums provide an unmatched opportunity to share your firm's greatest challenges and learn how other firm leaders have successfully dealt with the same difficulties. Bring your most vexing issues and a notepad, and be ready to return to the office with great new ideas for solving your firm's challenges! As much as we’d like everyone to fit the same mold, the inescapable fact is that multiple workplace generations create multiple perspectives. Differences in views on flexibility in location, career path, schedule, and work style have created a very different workplace. The firm that can meet multiple generations’ needs will attract a wealth of eager applicants and foster a more productive environment. In this session, Jeremy will share workplace best practices that balance client, firm, and individual needs and will help you maximize the potential of all the generations. One of the keys to employee retention (especially for your best people) is ensuring they feel they are valued and growing professionally each year. Unfortunately, many firms are stuck in a traditional coaching model that’s anything but inspiring – with coaches reluctant to coach, processes that involve more forms than relationships, and participants left feeling everyone’s just going through the motions. Join Christina as she brings her own brand of thought leadership to the issue. She’ll discuss a better approach to the coaching process to ensure your top performers are challenged and progressing in a way that keeps them engaged with the firm. Signs of change are everywhere, clamoring for your attention, but you can only tackle so many things simultaneously and stay profitable. 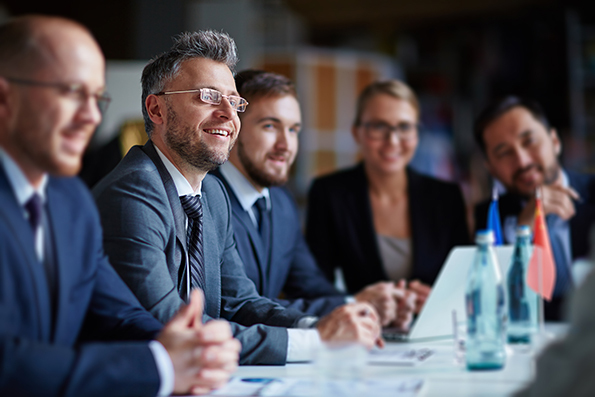 For the last two days, our experts have shared great ideas for recruiting, retaining, training and leading your people to help you create the firm no one wants to leave. This session is designed to identify those issues that deserve your attention now. You may already be working on some of them, but not finding the success you envisioned. Join Tim as he discusses how and where to begin to ensure your firm is prepared for what lies ahead. This year’s conference will be held at the JW Marriott Chicago, located at 151 West Adams Street, Chicago, Illinois. Reservations can be made online or by calling (312) 660-8200. 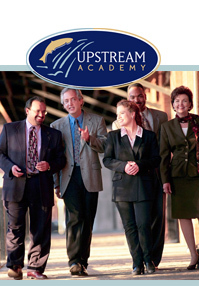 You will need to specify Upstream Academy to receive the special conference rate of $297.00 per night. We recommend making your reservation by September 26. If you have any problems with hotel reservations, please don’t hesitate to contact us for assistance. The hotel is located approximately 11 miles from Midway International Airport and approximately 17 miles from O’Hare International Airport. Taxi fare averages $40 from O’Hare International Airport and $35 from Midway International Airport. If you prefer to rent a vehicle, reservations for airport car rentals can be made in advance through rental agencies. The conference will run from 8am to 5pm on Thursday, October 25 and from 8am to 12noon on Friday, October 26. Upstream will provide a continental breakfast starting at 7am each day, breaks on both days, and lunch on Thursday. You and your adult guest are welcome to join us for a networking reception at 5:15pm on Thursday. Participants are on their own for dinner. Chicago’s magic lies in its mix: sophisticated yet friendly, bustling city streets adjacent to long stretches of green parks and sparkling blue Lake Michigan, and a stunning year-round array of things to see and do, unique in all the world. Chicago is more walkable than most large cities, and the hotel is located in the heart of downtown in close proximity to world renowned shopping, the Chicago Theater District, museums, and restaurants. With an endless assortment of theatre, music, dance, restaurants, shopping and nightlife at your fingertips and able to match every taste, budget and mood, come and discover why so many visitors fall in love with this city every year. Chicago’s many fine cultural institutions are fascinating places to learn and explore – and three of them are conveniently located on the beautiful Museum Campus just south of Grant Park. 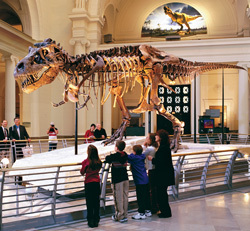 Here, on the city’s lakefront and just steps apart, you can see the world’s largest and most complete T. rex at The Field Museum, the space and sky theaters at Adler Planetarium, and, at Shedd Aquarium, the spectacular Oceanarium which recently completed a major renovation. In the block south of Millennium Park, The Art Institute of Chicago encompasses more than 5,000 years of human expression from cultures around the world as well as the largest collection of impressionist paintings outside of Paris. Founded in 1879, the Art Institute opened its newest addition – the 24,000-square-meter Modern Wing housing renowned Modern and Contemporary masterpieces – in May 2009. The 360 Chicago is a landmark building known for its pyramid shape and crossed outer beams. From the 94th floor John Hancock Observatory and the open-air Skywalk, you’ll enjoy sensational views of the city, lake, and, on clear days, the surrounding states of Indiana, Michigan, and Wisconsin. And the multimedia Sky Tour comes in adults’ and kids’ versions. The Museum of Science and Industry - the largest science museum in the Western Hemisphere, spanning nearly 14 acres - offers over 800 captivating interactive exhibits including the U-505 submarine, a working coal mine, a Boeing 727 airplane, and much, much more. No trip to Chicago would be complete without taking in a show in the legendary Loop District. Catch a production straight from Broadway at the Bank of America Theatre and Auditorium Theatres. Another treasure in the Loop theater district is the Goodman Theatre. The Goodman – whose productions, artists, and programs earned a Special Tony Award for Outstanding Regional Theatre - consistently produces unsurpassed classic and contemporary works. 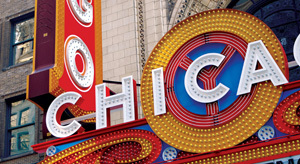 The legendary Chicago Theatre, whose famous C-H-I-C-A-G-O marquee lights up State Street. plays host to concerts, comedians, special events, and theatrical productions. Navy Pier is the place where all of Chicagoland and tourists from around the world have come together since 1995 to enjoy the beauty and the thrills of a day on Lake Michigan. From rides to restaurants, exhibitions to entertainment, shopping to dining cruises and tour boats, Navy Pier has it all - in a location unlike any other! Take a ride on the 15-story tall Ferris wheel, catch a movie at the IMAX® Theatre, or just kick back and enjoy the incredible feats of talented chinese acrobats in Cirque Shanghai. Sponsorship brings your company high-profile recognition and exposure to top decision-makers in CPA firms. Sponsorship is limited to seven companies. Who Will Attend? 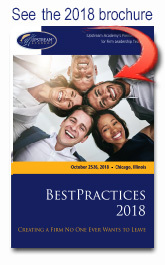 BestPractices will be attended by 130-150 Managing Partners, Partners, Managers, Firm Administrators and HR Professionals from top CPA firms across the United States and Canada. The conference will consist of sessions led by nationally recognized speakers and firm leaders. for coordination with the hotel and any additional cost. When your application is received, an Upstream representative will contact you to confirm availability on a first come, first serve basis. Upstream reserves the right to accept or reject any sponsor application. To be featured on the Upstream Academy website, please send your company logo along with a brief description of your company and/or services (no more than 50 words) to Kelsey at kelseym@upstreamacademy.com. This people oriented two day conference is held each fall. Here are a few brochures from past conferences. 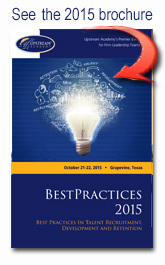 As with everything Upstream Academy does, your satisfaction with the BestPractices Conference is guaranteed. If you are not completely satisfied with the value you receive, we will, at your option, either refund your money or accept the portion of those fees that reflects your level of satisfaction. Upstream Academy will recommend 13 hours of CPE credit for participation in this course. Prerequisite: None Skill Level: Overview Learning Objectives: After attending the BestPractices Conference you will be able to identify and implement improvements to your team develpment skills, as well as your firm’s team development processes. Upstream Academy is registered with the National Association of State Boards of Accountancy (NASBA) as a sponsor of continuing professional education on the National Registry of CPE Sponsors. State boards of accountancy have final authority on the acceptance of individual courses for CPE credit. Complaints regarding registered sponsors may be submitted to the National Registry of CPE Sponsors through its website: www.nasba.org. 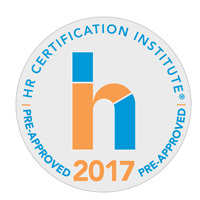 The HR Certification Institute has pre-approved this activity for recertification credit towards the aPHR®, PHR®, PHRca®, SPHR®, GPHR®, PHRi® and SPHRi® certifications. The content of the activity submitted has met the criteria of the Approved Provider Program. This course qualifies for 5.0 HRCI recertification credits.